Sri Dasam Granth was written by the tenth preceptor, Guru Gobind Singh which in recent times has seen much interest. The compositions within Sri Dasam Granth were written between 1680 and 1705 in places like Anandpur and Paonta Sahib. The internal dating within the compositions of Sri Dasam Granth refers to the locations and dates of compilation . 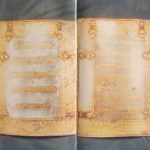 We are lucky to have this information, as we have no internal parameters within Sri Guru Granth Sahib as to when the banis were written. There are several compositions, which are referenced as being part of the Bachitra Natak Granth. Hence we need to consider what is the Bachitra Natak Granth. We find that it is a large composition within the Granth, containing the Apni Katha (My autobiography). This is an account by Guru Gobind Singh explaining his lineage and vivid accounts of his battles . This composition is written in the first person, so therefore a Kavi or poet other than Guru Sahib could not be the author. This composition was completed prior to the creation of the Khalsa, as it is not cited within it. It is quite clear that the compositions of Bachitra Natak Granth follow a specific pattern. After giving his biographical account, Guru Sahib in a section in Apni Katha refers to the various Avatars that came to the earth; they were selfish and did not worship Akal Purakh. The description of the Avatars is reinterpreted to bring it in line with Sikh thought and philosophy. The descriptions of Chandi, Krishna, Ram and the other Avatars that follow Apni Katha were written to put them in their proper context. For example in the composition Krishna Avatar, Guru Sahib narrates the stories of Krishna, but he is also critical of him and shows him being defeated in the hands of for Kharag Singh. The character of Kharag Singh is the epitome of the Khalsa and is a literary prototype of the Khalsa. The heroic qualities of Chandi are promoted so the masses of the time could realise that there was only one recourse, that of Dharam Yudh or ‘war of righteousness, against the Mughal regime. This campaign could only be undertaken by inspiring the common man with the heroic deeds of the Avatars and demoting their others aspects which were not in unison with Sikh thought and idolism. From these compositions it may give the appearance that the Bachitra Natak is a separate Granth. It is separate in a sense that the above compositions form the history and narration of the Avatars. However there is no original Pothi or manuscript written during the Guru period which bears the title Bachitra Natak Granth. There is however the title of Dasven Patshah Ju Ka Granth or “Granth of the Tenth Master” which appears on the original manuscripts of Sri Dasam Granth . So Bachitra Natak Granth is a part of Sri Dasam Granth but Sri Dasam Granth is not a part of Bachitra Natak Granth. It appears the confusion arises due to the fact that many compositions cite the words Bachitra Natak Likhyate within the text but an examination of the different compositions shows that there is more to Sri Dasam Granth than Bachitra Natak . It is also pertinent to consider that the various names given to Sri Dasam Granth over the course of time are similar to the evolution of names of Sri Guru Granth Sahib. Names Dasven Patshah ka Granth, Dasam Granth and ‘Dasam Guru Granth’ refer to Sri Dasam Granth. Similarly Pothi Sahib, Adi Granth and Guru Granth Sahib refer to the same scripture. Interestingly some 18th Century Dasam Granth recensions bear the title of Granth ji, that was a name that was given to Guru Granth Sahib recensions as well. This is because the Sri Dasam Granth was seen as complimentary to the Guru Granth Sahib. If we look at the historical sources in the 18th Century we see that the composition Bachitra Natak is cited in many if not all the pieces of literature of the time. This includes Gur Sobha Granth, (1701) by Kavi Sainapat whose work is completely based around the battles of Guru Gobind Singh mentioned in the Bachitra Natak. In Koer Singh’s, Gurbilas Patshai Dasvin, (1754), the author quotes from the Bachitra Natak. In Kesar Singh Chibbar’s Bansavlinama Dasan Patshahian Ka, (1769) he quotes many times from the Bachitra Natak and other compositions and gives us valuable information on the status of Sri Dasam Granth. The Rahitnamas mention the compositions of Sri Dasam Granth including the Bachitra Natak quoted within these ‘codes of conduct’. This includes the 17th century, Chaupa Singh Rahitnama. Whilst in the later Rahitnama of Bhai Desa Singh, the creation and compilation of Sri Dasam Granth is mentioned. The composition Bachitra Natak, is mentioned as follows, ‘Then I composed Bachitra Natak, in which I described the history of the Sodhi Family’ . Even the first English translation of the Bachitra Natak undertaken at the end of the 18th Century by Dr Leyden states that this forms a larger part of the ‘Dasven Patshah Ka Granth’ . In each piece of literature mentioned, the compositions of Sri Dasam Granth are referred to as being written by Guru Gobind Singh. In face of this clear examination of the primary and first hand accounts of the Guru and Sri Dasam Granth, the Bachitra Natak fits in around the Avatars. The several compositions which form the Bachitra Natak Granth were written to put the composition Apni Katha in its proper place when recounting the tales of the Avatars. If Apni Katha was not written it would not be clear why the Chaubis Avatar and the tales of Chandi were written. In various parts of the translation and transliteration of the Avatars the Guru makes explicit comments of how Sikh theology fits in and around these compositions. That is why we see that some of comments within Ram Avatar are elevated for use in the Rahiras . In conclusion ‘Bachitra Natak Granth’ is an early name of the compositions within Sri Dasam Granth. The original name for the writings of Guru Gobind Singh remains as it was during his life, Dasven Patshah ka Granth. We know that Ram Avtar was completed in 1698 as per the internal parameters within the Granth itself. The reference is as follows: This Granth has been completed (and improved) in Vadi first in the month of Haar in the year 1755 Bikrami (July 1698). The published version of Sri Dasam Granth was completed after the deliberations took place at Sri Akal Takht Sahib confirming the authenticity of the works. This took place between 1895 and 1898. Their report was published by the Sodhak Committee in 1898. Visit www.sridasamgranth.com for the full report. Some writers had tried to claim that the creation of the Khalsa is not mentioned in the Bachitra Natak and hence the composition is flawed. This is because they have not considered the dating of the composition. Interestingly Kavi Sainapat writing in 1711 who bases his whole Sri Gur Sobha Granth on the Bachitra Natak fails to mention this pivotal moment. This does not show that his description is flawed on the contrary he must thought the creation of the Khalsa was an assumed fact. Another alleged omission is that the martyrdom of Guru Arjan is not mentioned in the Bachitra Natak hence it being flawed. If we are to use this methodology we can ask why Bhai Gurdas whose work is considered the “key to Gurbani” did no mention this fact in his Vars either. In both cases this omission does not diminish the importance of the work. On the Patna Sahib recension of Sri Dasam Granth dated 1698, the colophon tells us this information. Some manuscripts have the name Bachitra Natak Granth within the Tatkara but these are very rare. Folio 182. This text is kept at the British Library, held under the McKenzie Collection., Eur MSS Mack xl. I worked on this manuscript between 2006 and 2008 and have made many observations on this important document. I intend to publish these in the future. The concluding Swaiya and Dohra from Ram Avatar are recited in the Rahiras path.